RandomPottins: Honouring Howard Andrews, at 101! Honouring Howard Andrews, at 101! THANKS to Dave Chapple in Somerset for sending this photograph, taken over seventy years ago in Spain. It is not a holiday snap. The civil war was raging, and this was a mobile clinic on the Teruel front, 1937. 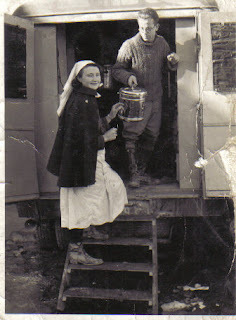 The man in the picture is Howard Andrews, from Kilburn in North West London, and he is handing down a pressure cooker containing sterilised bandages and surgical instruments to nurse Dorothy Rutter from Southampton. Despite the heroism and determination of the Spanish people and those who went out to help them, Franco's fascists won, with the backing of the Axis powers. Franco remained in power after the defeat of Mussolini and Hitler, in which Howard Andrews also did his bit, thanks to the Western powers' willingness to work with dictatorship in Spain. Today the fascist dictators have gone, but those who would like to resume their bloody work have crawled out of the woodwork to spread the poison of race hatred again. Imperialism, too, in its "democratic" form, is readier than ever to plunge us into war for the sake of dominance. 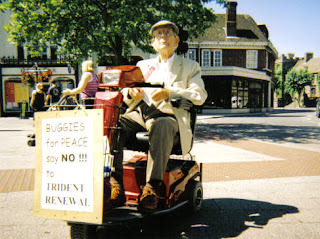 Fortunately there are still people prepared to stand up to the fascists and warmongers, and among them, still setting an example to the young, is Howard Andrews, 'Andy' as he is known to his friends, here seen turning up on his buggy to protest against Trident missiles. "Last minute announcement for the Left Field stage - we've just confirmed that a veteran of the Spanish Civil War will be opening the Love Music Hate Racism night on Saturday. Howard Andrews, known as Andy is 100 years old, and worked as a medic in field hospitals as a member of international brigades.He'll be opening the Love Music Hate Racism night with a few words about his experiences of fighting fascism in Spain, and why he supports the campaign against the BNP." Now Andy is going to be centre stage at another event. On Friday, February 15, to celebrate his 101st birthday, he will be guest of honour in Taunton at what Somerset trades unionists are billing as a "A Somerset celebration of international workers’ solidarity against capitalism, racism and fascism". Red Shadow Sound System, as well as food and a licensed bar. Sounds like a good night, and one for pride in a fine old comrade. The event is organised by the Somerset Association of Trades Union Councils, with the financial support of Taunton TUC and Somerset County UNISON (Andy's union). Does indeed sound like a good night. Comrades like Howard Andrews are an inspiration to us all.